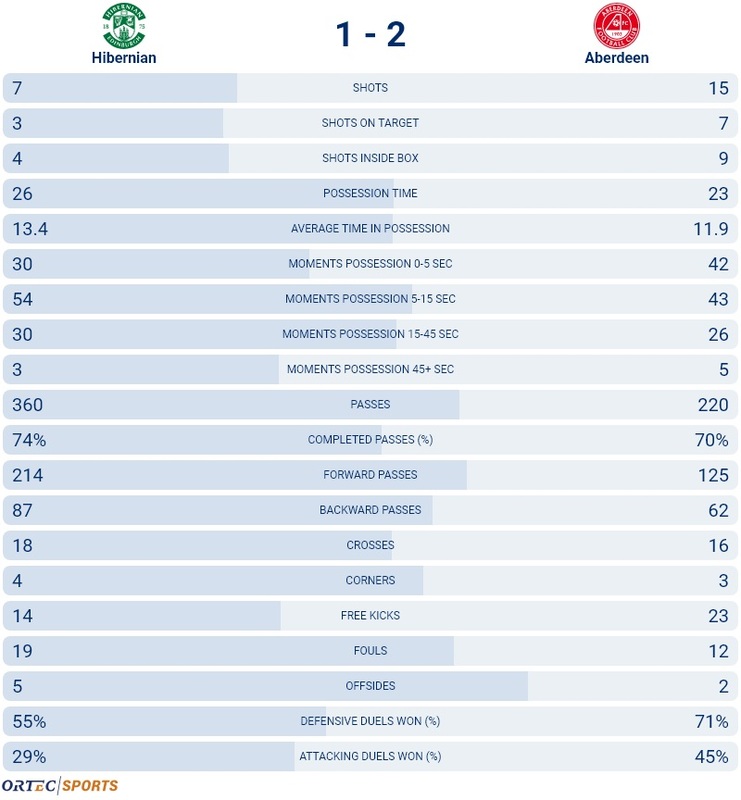 Aberdeen were deserving 2-1 winners at Easter Road on Saturday, and it could have been a few more had their finishing been better. It’s said that you could be able to identify certain coaches’ teams just by watching their style of play. Well, the same can be said for McInnes whose commitment to total man-marking has dumfounded most of his domestic rivals. It was once again on display here as they matched Hibernian’s 3-5-2 formation, but he did so while including four offensive players. Eddie May was in charge of Hibernian for the second time following the departure of Neil Lennon and his side had a very difficult time in imposing any semblance of a coherent style in possession. Aberdeen lost in-form striker Sam Cosgrove to injury after just fifteen minutes, but the intent to press Hibernian did not alter. With Max Lowe and Gary Mackay-Steven as wing-backs matching up against David Gray and Lewis Stevenson, Shay Logan became the third centre-back as he did against Livingston in late December. Stevie May was positioned behind the two strikers - both of whom were given a fluid role in the team - and tasked with helping the industrious duo of Graeme Shinnie and Lewis Ferguson. Aberdeen are a puzzlingly effective side. Since the departure of Kenny McLean, they function without a playmaker, most of the time bypassing the midfield and relying on their ability to win second balls. They focus all their ball-playing efforts in the final third and it is that individual quality that has seen them dominate against the bottom six clubs in the past four years rather than well-constructed build-up. And the clear distinction in style was apparent when you look at the concentration of both teams’ passing. Hibernian spent the majority of the time playing horizontally between their centre-backs or playing into their wing-backs only to then be forced backwards. 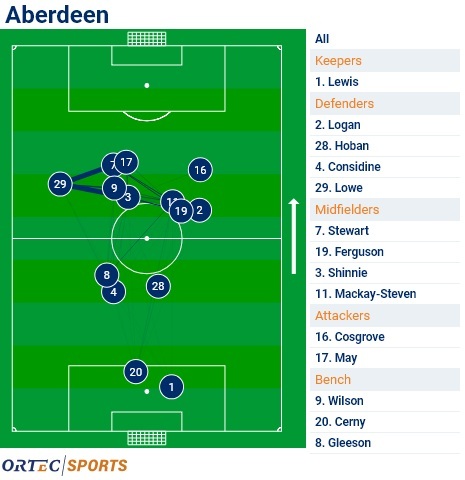 Aberdeen did well in pressing Hibernian, using a 5-2-1-2 system with their usual man-marking scheme all over the park. They managed to direct Hibernian’s passing towards Hanlon and McGregor, both of whom are not renowned for their distribution. Hanlon attempted 33 passes, 27 of which were successful, but most of them were across to Milligan. When he did attempt to break lines their success rate was limited. Aberdeen pressed really high. May positioned himself behind the deepest central midfielder, usually Marvin Bartley, and set the trap for the ball to be played into him. That forced the ball wide and that’s when Stewart and Wilson pressed from an out-to-in angle, guiding McGregor back in-field. McGregor didn’t need much persuasion to take a negative first touch, but the position of David Gray was also far too high and didn’t offer him the option of playing down the line first time. When the ball went back inside to Milligan, whose natural midfield qualities Hibernian had hoped to utilise in the build-up phase, Aberdeen’s entire defensive unit pushed up. This was orchestrated by Andy Considine who helped maintain a high line and limit the space between the three sections of the team. May left his position shadowing Bartley to pressure Milligan, while Stewart and Wilson remained narrow to block off passing lanes into the midfield. This invariably forced Hibernian to play back to Marciano who’s kicking twice almost resulted in an Aberdeen goal. Shinnie played higher up then Ferguson and was the second line of cover, often occupying space to sweep up contested balls. If you look at the location of where Aberdeen won back the ball you can see how effective they were at winning the ball high up. Aberdeen’s contrasting style is illustrated by the raw numbers. Their three centre-backs attempted just 28 passes the full game and only 17 were successful. They were able to gain territory by playing long and winning the battle for second balls. Shinnie and Ferguson are not midfielders who can control a game or who are gifted passers of the ball, but they are both very strong at anticipating knock downs and in using their bodies to win fouls. Shinnie’s advanced position can be measured by the 19 passes he attempted in the final third, the most he has had in any game this season. Aberdeen’s attacks were mainly focused down the left wing, which is not a surprise considering how influential Lowe has been. He and Stewart showed a good understanding between one another as Aberdeen tended to overload that side. Gray struggled to deal with the quick exchanges and was lacking support from his right-side midfielder. One interesting tactical ploy from McInnes was the use of Logan as the right-centre back. He was tasked with pushing up into the centre of the field when the space opened up for a switch of play. Shaw was reluctant to follow him all the way back, but three times this happened in the first half and forced Stevenson to come out of position. Aberdeen countered extremely well, with Stewart and Wilson’s roles as wide forwards presenting a regular outlet to spring from. Lowe constantly got up in support, as did, May and this formation definitely makes Aberdeen a more dangerous side with threats from more areas of the park. Wilson twice went on solo runs from his own half which nearly resulted in goals. Stewart was terrific and did most of his best work immediately after Aberdeen had overturned the ball. McInnes has recognised that he needs the freedom to roam to be at his best and this is what saw him pick up the ball behind the Hibernian midfield and drive at goal. What Hibernian did well in the early stages of the game was utilise Shaw. He caused problems by dropping into pockets of space on the left side between Mackay-Steven, Shinnie and Logan. Aberdeen’s centre-backs are not comfortable marking space. Especially when up against two forwards they are unsure whether to follow all the way into midfield. This was what allowed him to score the opener as they were hesitant to come out of their shape and pressure, while Ferguson was too caught up in man marking Mallan despite obvious danger being three yards to his right. But Hibernian failed to exploit this thereafter. One way to counteract Aberdeen’s man for man marking that few teams seem to have identified is to vacate the middle of the pitch. Shinnie and Ferguson track their counterparts to prevent the ball from progressing through the middle, so how do you solve that? Well, you can start by drifting away from that crowded area and hoping they follow. And most of the time they do. Mallan did it once in the first-half, showing how simple it an be at times to create an avenue into the striker’s feet. He simply made a run beyond Shaw, which dragged Ferguson back into the defensive line, and allowed Shaw to drop in to the gulf created. It’s why Aberdeen’s block, as disciplined and dogged as it is, can also be lopsided. Hibernian found space in the inside right channel numerous times as Shinnie and Ferguson had been pulled to the right. Hibernian brought on Gael Birigimana for his debut, replacing Bartley ten minutes after half time. That did coincide with the home side beating the press for literally the first and only time a mere two minutes later. All it took was two players dropping into the centre to play around May but it was not repeated again and Birigimana’s pass selection was tentative. Aberdeen take on Rangers in what is bound to be a frantically contested match. McInnes will likely revert to a 4-2-3-1 formation but if they press as well as they did against Hibernian, Steven Gerrard’s side will have a tough time playing through them – unless they have learned from the mistakes made in the previous three meetings.